Quantum entanglement shows that there are non-supervenient relations among physical systems over and above the spatio-temporal relations. These two archipelagic bodies of work coalesce in their use of photography as a contraction of time and space. Overcoming physical, temporal and abstract distances, the images act as indexical references, portals to cultures far removed from their current context of liminal spaces in the city of Melbourne. Through Eden Row’s pictorial investigation into the community’s sense of place and functionality and Cecilia Baker’s subjective exploration of her migration, a unique permutation of experience is created that informs a more holistic embodiment of global citizenship. Together, the works contribute to an exchange where neither individual nor collective identities are fixed or absolute, but rather possess an ability to evolve through intercultural dialogue while preserving their own senses of self. Tundikhel park, in central Kathmandu, is home to a microcosm of social structures. Once serving as grounds for the declarations of the Rana dynasty, it has since become a space for military parade, disaster relief and leisure. Today, Tundikhel occupies only half of its initial perimeter and public access has been restricted to just one third. Its newly erected fences act as an inhibitor of both entry and further encroachment, demonstrating the fragility of civic spaces within dense, urban environments. 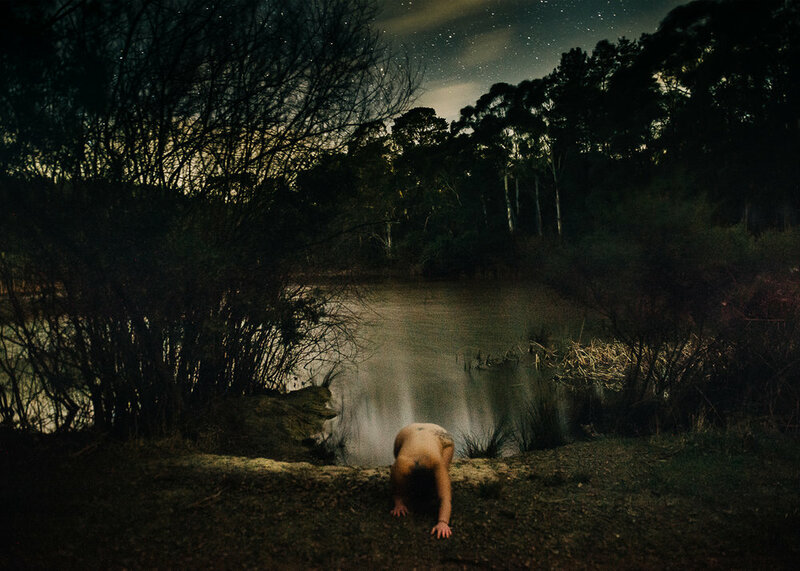 Eden Row is a visual artist and photographer currently based in Melbourne. His practice is centred around the field of long-form documentary, whereby he utilises visual strategies and trans-media methodologies to explore sociopolitical phenomena. Eden’s work has been exhibited in Australia and internationally. In 2018 he was the recipient of the Paul Olsen Award, and was a finalist for the Robyn Beeche Foundation Photography Prize. In 2006 there was a short, scientific report on a species of moths from the island of Madagascar named Hemiceratoides Hieroglyphica. It was discovered that these moths frequent sleeping birds at night and drink their tears. Moths Drink Tears of Sleeping Birds is an attempt at understanding the dynamics and complexities of migration, senses of identity, home and displacement, and navigating volatile relationships within a new land. Drawing from the artist’s own subjectivity, this project takes the form of a non-linear narrative in which the oneiric imagery unfolds as an organic flow of memories, feelings and thoughts. Cecilia Baker grew up in the Brazilian countryside, where she received her first camera at the age of 9, igniting a life-long passion for photography. Living in Melbourne since 2007, her work explores themes of migration, memory, loss and intimacy. In 2018 Cecilia was named in Capture Magazines ‘Top 30 Australasia’s Emerging Art Photographers’, and will be exhibiting in the Head On Photo Festival in 2019. Cecilia is currently studying a Bachelor of Arts (Photography) (Honours) at RMIT in Melbourne.